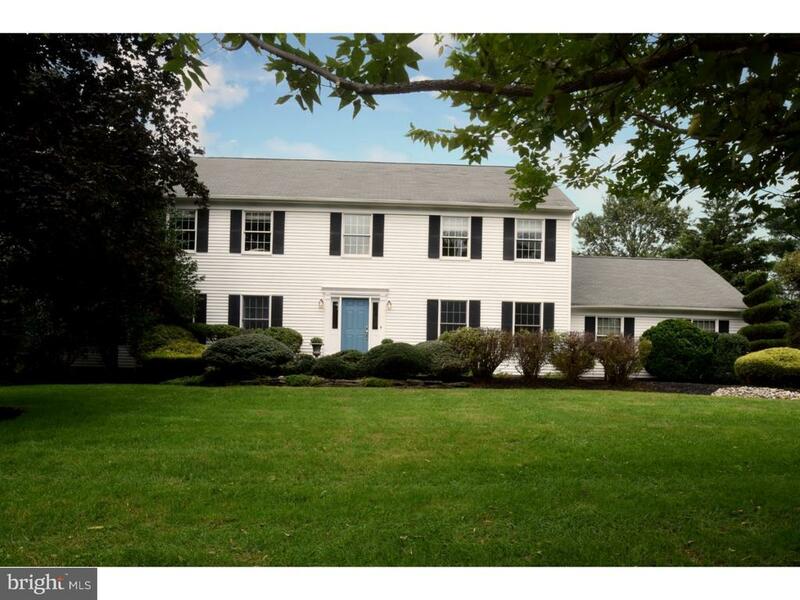 This impressive center hall colonial will delight the discerning home buyer. This property has been beautifully maintained and re-decorated, demonstrating the warm and luxurious lifestyle that awaits its lucky new owners. Enter through the two-story foyer to find wood floors, a formal dining room with chair rails on the right, and, on the left, a gracious living room with French doors that, in turn, open to a delightfully secluded office space. You and your guests move easily through the open floor plan to find the updated kitchen and stunning family room with gas fireplace surrounded by custom tile and mantle. The kitchen offers cherry cabinets, granite counter-tops, a beautiful tile back-splash, a center island with pull-up seating, and a roomy breakfast area with views to the patio and the in-ground pool beyond. On the second floor youll find an incredible master suite, 2 adorable youth bedrooms, a restfully appointed guest room, and an updated hall bathroom. The spacious master bedroom gracefully accommodates a king-size bed and formal bedroom furnishings. The newly (2018) renovated master bath is nothing short of breathtaking, with vaulted ceiling, a contemporary shower enclosure, separate tub, new vanity and fixtures. Tile and finishing materials are in subtle shades of gray and white for a sleek and absolutely up-to-the-minute look. A (partially) finished basement space for entertainment, crafts, music and exercise equipment complete the home. In addition, this is a "smart home, " equipped with the latest technology to enhance "connected" lifestyles. Outside, visitors will enjoy the professionally landscaped grounds and the separately fenced pool area. Beyond that, youll find many other attractions nearby, including Mercer Oaks Golf Course, Conover Field for soccer, cricket and baseball players, and Mercer County Park with tennis, bike riding, ice-skating and more. And for commuters, youre just 7 minutes from Princeton Junction train station! Make this fabulous home yours today!